Thomas Richard "Tom" Carper is the senior United States Senator from Delaware, serving since 2001. A member of the Democratic Party, Carper served in the United States House of Representatives from 1983 to 1993 and was the 71st Governor of Delaware from 1993 to 2001. 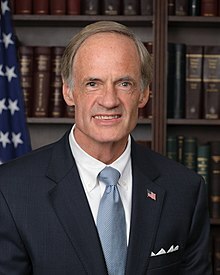 Thomas Richard "Tom" Carper (born January 23, 1947) is the senior United States Senator from Delaware, serving since 2001. A member of the Democratic Party, Carper served in the United States House of Representatives from 1983 to 1993 and was the 71st Governor of Delaware from 1993 to 2001. A native of Danville, Virginia, Carper graduated from Ohio State University. Serving as a Naval Flight Officer in the U.S. Navy from 1968 until 1973, he flew the P-3 Orion as a Tactical Coordinator/Mission Commander and saw active duty in the Vietnam War. After leaving the active duty Navy, he remained in the U.S. Naval Reserve for another 18 years and eventually retired with the rank of Captain (O-6). Upon receiving his MBA from the University of Delaware in 1975, Carper went to work for the State of Delaware in its economic development office. He was elected State Treasurer, serving from 1977 to 1983 and leading the development of Delaware's first cash management system. Encouraged by local politicians, Carper successfully ran for Delaware's only seat in the U.S. House of Representatives in 1982. He served five terms in the House, where he chaired the Subcommittee on Economic Stabilization. In 1992 he arranged a swap with term-limited Governor Michael Castle, and the two were easily elected to each other's seats. Carper governed for two terms as a moderate, business-oriented New Democrat, following the lead of the two previous Republican governors. He successfully prevented the closing of a General Motors automobile plant and won a bid for the headquarters of pharmaceutical giant AstraZeneca. He led a tax-reduction campaign and helped improve the state's credit rating from among the worst in the nation to an excellent AAA. He pushed for standards-based education, among other reforms. Carper was elected to the U.S. Senate in 2000, beating Republican incumbent William V. Roth, Jr.. He was re-elected by landslides in 2006 and 2012. As senator, he serves as one of four Deputy Democratic Whips, serves as the ranking member of the Senate Homeland Security Committee and also serves on the Senate Committee on Environment and Public Works and the Senate Committee on Finance. Carper is currently the dean of the Delaware congressional delegation.